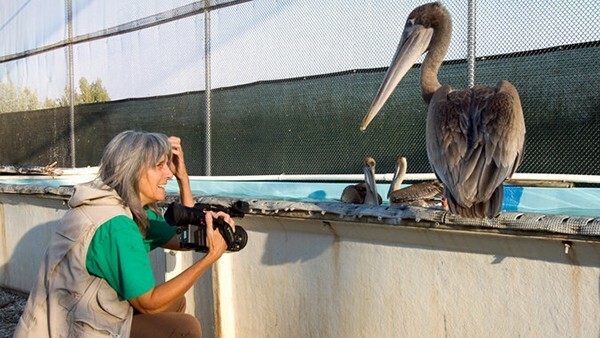 Judy Irving with Gigi, the rescued brown pelican from her documentary. So that’s exactly what Judy Irving did. The American filmmaker chronicled Gigi’s (short for Golden Gate) journey after seeing the emaciated bird captured by law enforcement and brought to a rehabilitation center in her documentary feature, Pelican Dreams, showing at Upstate Films in Rhinebeck on February 8. "I didn't set out to do an investigation, but the more I got into it the more I realized they really are in trouble," Irving said. Gigi’s journey acted as a vessel for Irving, bringing her from simple curiosity to impassioned realization: brown pelicans are struggling despite being taken off of the endangered species list in the 1970s. Previously endangered due to excessive pesticide pollution, brown pelicans populations have experienced reproductive failure for the last five years. Despite this alarming new development, Irving’s film focuses more on the beauty of this marine bird and their quirky personalities. The variety of shots Irving uses illustrate the awkward gawkiness of young pelicans and their development into the graceful birds with 7-foot wingspans that swoop and dive around our coastal cities. Irving experiences the brown pelicans’ lives firsthand, from their nesting habits to their migratory routes and the challenges they face. Where Gigi provides the narrative arc, Irving gives her and her fellow brown pelicans a voice. Her careful coverage of Gigi’s rehabilitation also addresses our relationship with wildlife. While Irving fondly gives the pelican a nickname, Gigi’s caretaker calls her “Pink-193,” the color and number of her tracking band to maintain emotional distance. Irving walks a tightrope between her love for these birds and the knowledge that too much human interaction could hinder their progress. She’s won several awards for her films, including the grand prize at the Sundance Film Festival and a National Emmy Award, “Outstanding Individual Achievement in News & Documentary,” for her nonfiction piece on nuclear weapons told by those directly affected. Her documentary, The Wild Parrots of Telegraph Hill, focuses on a man with an impossibly intimate relationship with a flock of wild parrots in San Francisco. The documentary won a Genesis award for Outstanding Documentary Feature by the Human Society, a national humanitarian award, and audience awards at the Ashland, Maine, and Black Bear film festivals.